Active loudspeakers are becoming increasingly popular as more and more people are using nothing but digital music players. The wide selection on the market makes it important to look carefully before you choose. It is important to assess your needs and consider both the sound and the design. The Opalum Sound System features ultra-thin, active loudspeakers, designed to provide magnificently resonant, full-bodied sound from your smartphone, iPod, iPad, MP3 or computer—or from your flat-panel TV or stationary music system. At the same time, Opalum is designed to blend in with its surroundings and allows plenty of room for other furnishings. Opalum takes an innovative approach which eliminates the need for thick power cables. Opalum’s speakers have a built-in amplifier and, as a unique new feature, they receive electricity and sound signals through the same thin signal cable connecting loudspeaker and hub, the latter of which is the focal point for all your music and sound devices. This special cable technology was developed and patented by Pär Gunnars Risberg, Sweden, who in so doing has set new standards for the “wireless speaker” concept. 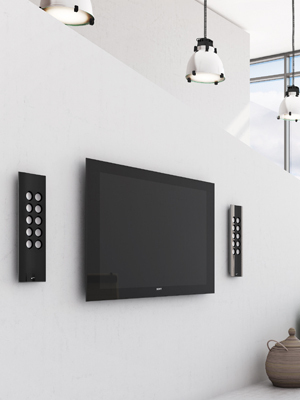 Opalum’s speakers and sound system let you experience a superbly clear, stable signal from your digital player to the hub, and the music is effortlessly controlled even if you are in the kitchen or the bedroom—and the hub is in the living room. If you want a wireless connections between your music unit and the loudspeakers, the hub must be connected to AirPort Express or Bluetooth. Once connected, you are ready to enjoy both fast and reliable access to your entire iTunes library and everything stored on your smartphone, Mac or Windows computer.